Share "Saltwater Vs. Freshwater Aquarium"
It’s tough to choose between saltwater and freshwater aquariums. They both come with many advantages and disadvantages. There are also many differences in terms of setups, costs, maintenance, and types of fish. This article is intended to inform those aquarium enthusiasts about the main differences in keeping a saltwater aquarium versus a freshwater one. Electing a freshwater aquarium is often recommended for those people who are starting with their first aquarium. In general, freshwater tanks are easier to maintain and present fewer risks. Also, freshwater tanks are less expensive than saltwater environments. A freshwater tank can be a glass or acrylic of any size. 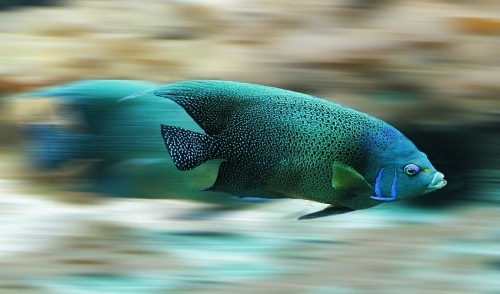 Most freshwater tanks include fish such as cichlids, betta fish, and tetras fish. Each of these fish can demand a different kind of tank setup, but all are simple and easy to care for. For beginners, start with a simple tank, a good filtration system, and a fish only environment. Implementing live plants into a freshwater environment can make managing the tank a bit more complicated. The variety of fish will not be as diverse, but the cost of these species will not be as expensive. In the saltwater world, everything gets taken up a notch. The costs, the maintenance, the tank size, and the fish all require some additional effort. Saltwater tanks are not cheap, but buy the biggest tank you can afford if possible. This is important because without the right size or salt level, your fish will be unable to thrive. Saltwater tanks also require more filtration. Filtration is the key to a healthy saltwater aquarium. There are three basic types of filtration: biological (Live Rock), mechanical, and chemical. If you choose to use a live rock filtration system, you will need a protein skimmer to remove dissolved waste. However, if this is your first saltwater tank, I recommend using a chemical or mechanical filtration system. A fish only environment will be the easiest to startup and the cheapest in comparison to reef tanks and fish with live rock environments. Even though saltwater tanks are more precarious to maintain and demand more responsibility, the rewards are much greater. Saltwater fish may be more expensive, but when you see the level of variety you can achieve your jaw just may drop. Saltwater tanks offer much more color and beauty than freshwater tanks. Some popular and inexpensive fish that you can include in your aquarium are clownfish, dwarf angelfish, and damselfish. In general, owning a saltwater aquarium can be more difficult and more expensive than owning a freshwater one. However, once a saltwater tank is completely set up, they become less demanding and most of the expenses come from purchasing the fish you want. Saltwater aquariums enable owners to build a water environment that is more vibrant and colorful than a freshwater tank. All in all you should weigh your options, and determine which one is best for you.